If you look down from the Nonnberg Abbey towards South, you will easily find the Hellbrunner Allee leading to the Hellbrunn Castle. Half way down to Hellbrunn, you can see a very large, modern building with lots of local marble, glass and patios. This is the building of the Natural Science Faculty in Hellbrunner Allee 34. It is Salzburg′s second largest building after the Hohensalzburg Fortress. The Science Faculty or "Nawi" was opened in October 1986. It is the largest single university building in Austria and contains three large lecture theatres including Salzburg University′s Auditorium Maximum (main lecture theatre), an open-air amphitheatre, a media studio, a kindergarten for employees′ and students′ children, a large canteen with a cafe and extensive botanical gardens. Going there might be worthwhile, the building is remarkable by itself, but also very close to the Freisaal Castle, the Hellbrunner Allee and not far from the Erhardkirche Church in Nonntal. The back of the Science Faculty is neatly blended into the surrounding landscape through an artificial lake. There is a crucifixion statue by the lake by the Viennese artist Alfred Hrdlicka. From here, you will get to the Botanical Gardens of the university. The interiors host Salzburg University′s departments of Earth Sciences, Biological Sciences and related subjects, Psychology and partly IT and mathematics as well as Science Education. 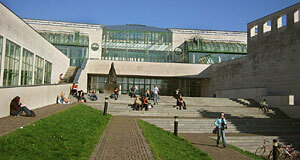 More than 4 000 of Salzburg University′s 13 000 students attend lectures in this building. A greenhouse in the central patio spans over all floors and give a lofty and light touch. A round square in the front of the building focuses on a fountain in the centre. The light and pinkish "marble" (it is not true marble in the geological sense) was taken from the local Untersberg Mountain and can be found in many buildings of Salzburg. The architects responsible for this positively outstanding Faculty building were Ekhard, Hübner Ladstätter and Marschalek in a team around Clemens Holzmeister.